TORONTO [For immediate release] After analyzing four years of Kepler space telescope observations, astronomers from the University of Toronto have given us our clearest understanding yet of a class of exoplanets called “Warm Jupiters”, showing that many have unexpected planetary companions. The team’s analysis, published July 10th in the Astrophysical Journal, provides strong evidence of the existence of two distinct types of Warm Jupiters, each with their own formation and dynamical history. The two types include those that have companions and thus, likely formed where we find them today; and those with no companions that likely migrated to their current positions. 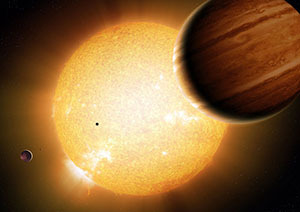 Warm Jupiters are large, gas-giant exoplanets—planets found around stars other than the Sun. They are comparable in size to the gas-giants in our Solar System. But unlike the Sun’s family of giant planets, Warm Jupiters orbit their parent stars at roughly the same distance that Mercury, Venus and the Earth circle the Sun. They take 10 to two hundred days to complete a single orbit. Because of their proximity to their parent stars, they are warmer than our system’s cold gas giants—though not as hot as Hot Jupiters, which are typically closer to their parent stars than Mercury. It has generally been thought that Warm Jupiters didn’t form where we find them today; they are too close to their parent stars to have accumulated large, gas-giant-like atmospheres. So, it appeared likely that they formed in the outer reaches of their planetary systems and migrated inward to their current positions, and might in fact continue their inward journey to become Hot Jupiters. On such a migration, the gravity of any Warm Jupiter would have disturbed neighbouring or companion planets, ejecting them from the system. But, instead of finding “lonely”, companion-less Warm Jupiters, the team found that 11 of the 27 targets they studied have companions ranging in size from Earth-like to Neptune-like. 1. Launched in 2009, the Kepler space telescope has discovered over 2000 exoplanets orbiting distant stars located in a patch of sky in the constellation Cygnus (and the number is rising as exoplanet candidates are confirmed as actual exoplanets through follow-up observations). Kepler cannot see an exoplanet orbiting its parent star; they are too far away, too small, and their parent stars too bright for any telescope to resolve them. 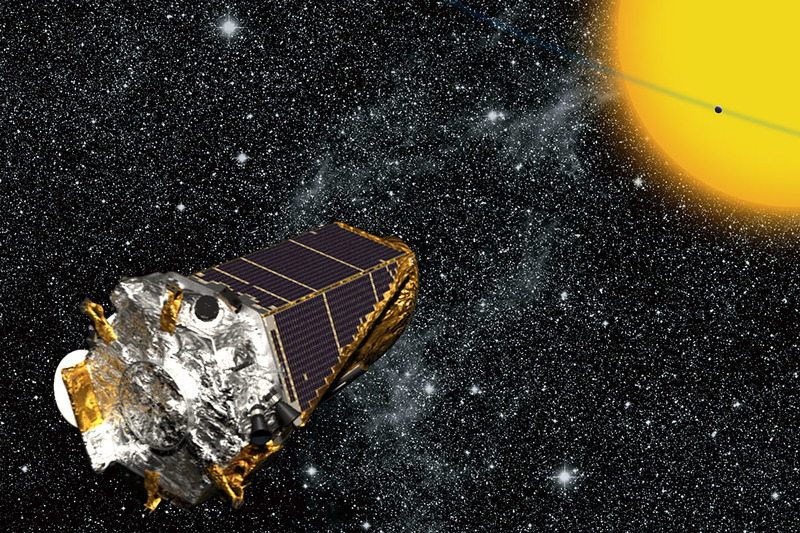 Instead, Kepler measures the brightness of a star with enough accuracy to detect the slight decrease in brightness caused by an exoplanet moving in front of it. 2. In addition to the insight into Warm Jupiters, the analysis also provided the most conclusive evidence yet that Hot Jupiters lack companions and likely migrated to their current orbits. One exception is the recently discovered HJ known as WASP-47b, which was found to have companions. 3. NASA’s Ames Research Center in Moffett Field, California, manages the Kepler and K2 missions for NASA’s Science Mission Directorate. NASA’s Jet Propulsion Laboratory in Pasadena, California, managed Kepler mission development. Ball Aerospace & Technologies Corporation operates the flight system with support from the Laboratory for Atmospheric and Space Physics at the University of Colorado at Boulder. The Dunlap Institute for Astronomy & Astrophysics at the University of Toronto is an endowed research institute with over 40 faculty, postdocs, students and staff, dedicated to innovative technology, groundbreaking research, world-class training, and public engagement. The research themes of its faculty and Dunlap Fellows span the Universe and include: optical, infrared and radio instrumentation, Dark Energy, large-scale structure, the Cosmic Microwave Background, the interstellar medium, galaxy evolution, cosmic magnetism and time-domain science. The Dunlap Institute, together with the Department of Astronomy & Astrophysics, the Canadian Institute for Theoretical Astrophysics, and the Centre for Planetary Sciences, comprise the leading research centre for astronomy in Canada, at the leading research university in the country. The Dunlap Institute is committed to making its science, training and public outreach activities productive and enjoyable for everyone, regardless of gender, sexual orientation, disability, physical appearance, body size, race, nationality or religion.